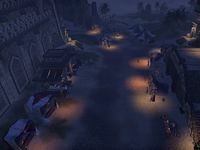 The Sentinel Bazaar is a marketplace located in southern Sentinel. It is split into a western section and an eastern section by the bridge leading to Fahara'jad's castle. The Bloody Crescent — A weapons stall run by Gabir. Diviner's Delight — A stall owned by the mystic Vivonne Ancelet. Dune-Singer Apparel — A light armor stall owned by Balabar. Bent-Blade Outfitters — A medium armor stall owned by Ysarne. Hollow Drum Haversacks — A stall run by the pack merchant Dahla. Sand-Sifter's Mercantile — A general goods stall run by Boussa. The Sanded Scorpion — A stall owned by the woodworker Muruuna. Stone Hammer Armorers — A heavy armor stall run by Ragbul. This page was last modified on 29 September 2016, at 01:21.